My flock began with speckled face bottle lambs and a Suffolk ram lamb. Since then I have tried several different breeds of sheep: Hampshires, Corridale, Columbia, North Country Cheviots, Rambouliet, Polypay and others. I really do not have a favorite breed, each has good qualities. I do think the specked face cross bred ewe is hard to beat for mothering ability, milk production, and health. I prefer Hampshire rams because they seem to produce lambs that grow quickly with good feed conversion. I keep a wide variety of sheep breeds because they each react differently when worked by the dogs. I try to expose the dogs to heavy and light sheep so the dogs become well rounded and confident with all sheep. I enjoy lambing around February, retaining lambs for replacements for myself and others then fatten the remaining lambs for market. I also have lambs availablefor 4-H projects. 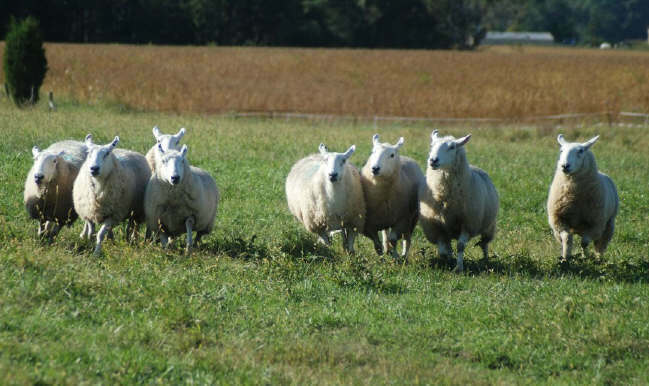 In recent years the flock have become had of a North Country Cheviot influenece. The ewes are tough, great mothers, milk well and the lambs sure grow. The NCC ewes are more seasonal so I have adapted to pasture lambing them in April and continue to lamb other ewes in the barn in Feb, it has been working well. 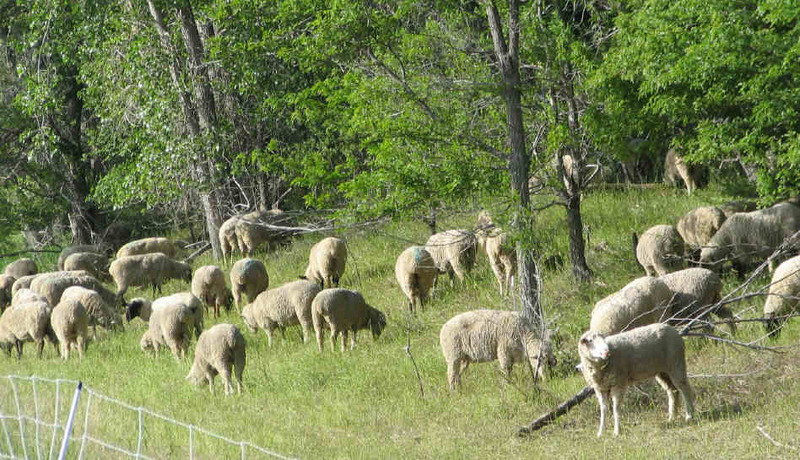 Predation of lambs by coyotes and stray dogs is always a concern for those of us with sheep. Chewy is a Great Pyrenees and his sole job is to protect the flock from any threat. He is ever vigilant at night and patrols his territory for any intruder, during the day he can be found sleeping close to the barn under a shade tree. He is not as bonded with sheep as some LGD’s are, he enjoys playing with the other dogs. He has the run of the place and will keep the raccoons away from the garden, the deer out of the alfalfa and many people in their cars. MIST came to join Clearfield Stockdogs in March 2011. She is such a cutie. Hard to believe she will be protecting the flock. Mist has grown up to be a super guardian. Ever watchful and a great girl. I sleep better at night knowing she is her on the job. If the sheep ever get out she will be right there with the flock. She always chooses the group farthest from the barn to hang out with. Chewy is getting up there in age so Mist has stepped up to be the main dog that protects the flock. I am sure she thinks of them as HER Sheep which is all good. Snow joined the group in Feb of 2012. She has grown a bunch and doing well alerting to danger. She works differently than Chewy and Mist moving the flock away from danger while they confront the threat. What a good team I have.